The IBM XIV® Storage System has a rich set of copy functions suited for various data protection scenarios that enable you to enhance your business continuance, disaster recovery, data migration, and online backup solutions. These functions allow point-in-time copies, known as snapshots and full volume copies, and also include remote copy capabilities in either synchronous or asynchronous mode. A three-site mirroring function is now available to further improve availability and disaster recovery capabilities. These functions are included in the XIV software and all their features are available at no extra charge. The various copy functions are reviewed in separate chapters, which include detailed information about usage and practical illustrations. 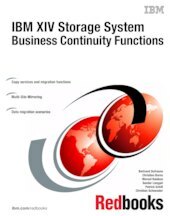 The book also illustrates the use of IBM® Tivoli® Storage Productivity Center for Replication to manage XIV Copy Services. This IBM Redbooks® publication is intended for anyone who needs a detailed and practical understanding of the XIV copy functions.